It’s Michigan News, and it’s AWESOME. Richard Lenski is not only a swell guy, but a world-class researcher. He recently published some fascinating work on E. coli evolution. Then, the owner of Conservapedia demanded to see his data. It was clear that he hadn’t read Lenski’s paper at all. Their entire correspondence is reproduced at Bad Science, and it will warm your little evolutionary cockles. 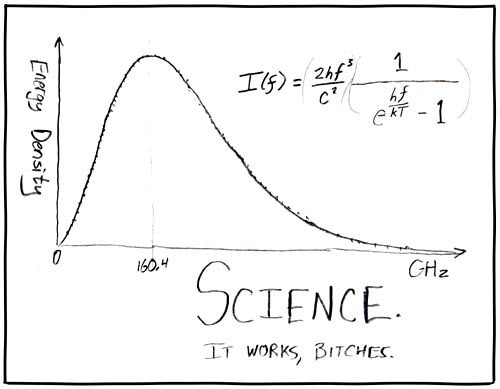 And, because I can, a favorite xkcd comic. I love the picture, where’s it from? Well, I’ve worn this to school. But of course, my kids are older…. Great, great, great dialogue between Lenski and Shlafly. xkcd – it’s my new favorite cartoon. If you haven’t found it already, I think you might equally enjoy [a href=”www.toothpastefordinner.com”]toothpastefordinner[/a]. ughhh… I see html code isn’t allowed in comments. oh well, i think you’re smart enough to figure it out. Nice display on Blog of the Day list. See? Franklin was right: In a fair fight, truth wins. Sometimes. If it’s not Swift Boated. Just to make myself look a bit more clever, I’ve done a quick analysis of how much reach Conservapedia actually has here: http://layscience.net/?q=node/158 . Judging by my results, I think they’ve well and truly lost the P.R. battle on this one! I hope so! Nice work, martin.